The head of a coalition of state law , Nuri al - Maliki on Tuesday the importance of supporting the next government, noting that Iraq seeks better relations with various countries of the world, while renewed his rejection to "blockade" imposed on Iran . 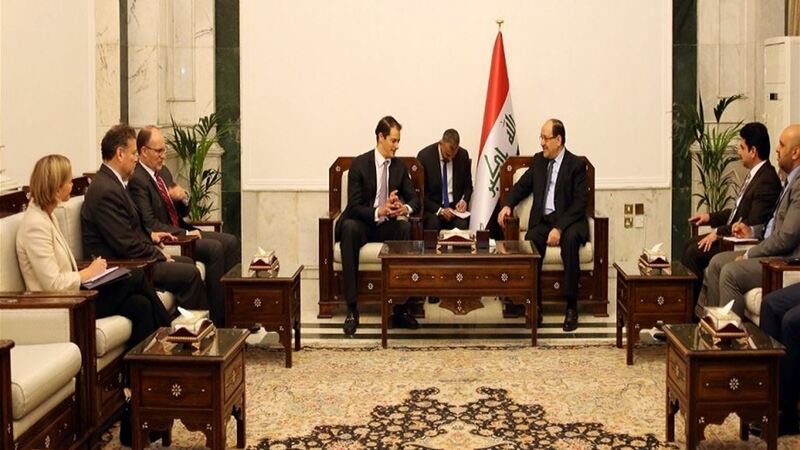 "The head of a coalition of state law, Nuri al-Maliki, received today, the official file of affairs of Iraq and Iran in the United States of America Andrew Beck, in the presence of Ambassador Douglas Silliaman, " Maliki's office said in a statement received by Alsumaria News . During the meeting, the two sides reviewed the future of bilateral relations between the two countries and means of enhancing them, and exchanged views on the latest developments and developments in the region, in addition to ongoing dialogues to form the next government. The statement quoted al-Maliki as saying that "the stability and security of the region as a whole starts from the stability of Iraq," stressing the "importance of supporting the next government and its success in achieving the aspirations of the Iraqi people." He added that "Iraq seeks to establish the best relations with various countries of the world and rejects the policy of axes, the interest of Iraq to be a yardstick to bring together different points of view," again "the position that rejects the principle of the embargo on Iran or any other country because it will affect mainly on the peoples of various social strata "He said. On Wednesday, August 8, 2018, al-Maliki expressed his rejection of the US sanctions imposed on Iran, calling them a "flagrant violation" of international law, while calling on the Iraqi government not to be a party to these sanctions.